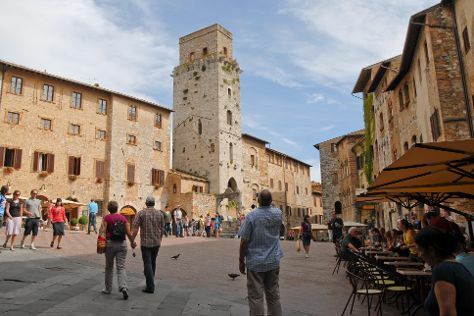 Step off the beaten path and head to Historic Centre of San Gimignano and Abbazia di San Galgano. Explore the numerous day-trip ideas around Florence: Lucca (St Martin Cathedral, Piazza Anfiteatro, & more), Pisa (Torre di Pisa, Battistero, & more) and San Gimignano (Piazza della Cisterna, San Gimignano Bell Tower, & more). Dedicate the 8th (Sun) to wine at some of the top wineries in the area. There's still lots to do: admire the masterpieces at Uffizi Galleries, enjoy breathtaking views from Torre del Mangia, contemplate in the serene atmosphere at Cathedral of Santa Maria del Fiore, and get great views at Basilica San Miniato al Monte. To see other places to visit, where to stay, maps, and more tourist information, you can read our Florence online road trip planner . Expect a daytime high around 35°C in July, and nighttime lows around 21°C. Finish your sightseeing early on the 29th (Sun) to allow enough time to travel back home.